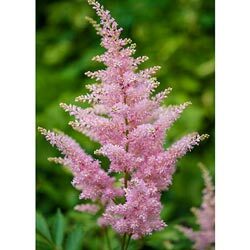 An elegant plant highlighted with towering flower spikes. 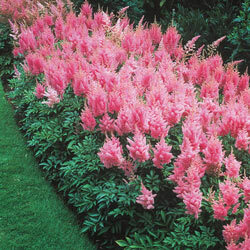 Soft plumes of pink are offset by green, fern-like foliage. Plants stay attractive throughout the growing season and have the added benefit of deer resistance. Foliage Type: Dark Green compound leaves - leaflets ovate to oblong - doubly serrate. Pruning: May want to remove spent flower stems. Can divide after a year or two. Winter Care: Provide a mulch the first winter, especially if fall planted. Additional Information: Good planted with Lady, Maidenhair or Japanese Painted Ferns, Hosta varieties.